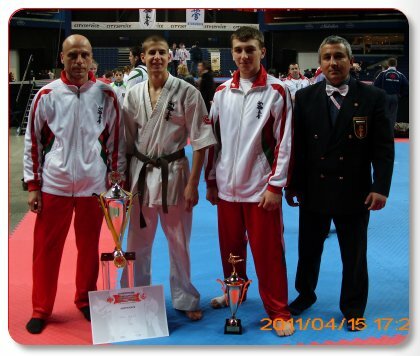 During the first half of the competitive year 2011 the karatekas of SC "Kyokushin" Shumen have made their best performance in the history of the club, so far having won 71 medals in all age groups from official competitions of the Bulgarian Karate-do Kyokushin Federation's sports calendar. Shumen's trainees also had a strong presence in the European Shinkyokushin championship, which took place on the 15th and 16th of April in Vilnius, Litva. Great joy was brought to us by the young national competitor of Shumen, Bogomil Tiholov, who became the european champion for the second time in the kadets 55kg category, winning every match by knockout and the referees also awarded him the prize for the best technique in kadets. In his first match our fighter definitevly won over Reckus Deividas of Litva with ipon, in his semifinal he knocked out Baranov Denis of Ukraine and in his final match against Auga Romualdas - a fighter from the home country, Shumen's young karateka did not meet any obstacles, winning his match long before the end of regular time by knockout. The other national competitor from Shumen, Georgi Iordanov, also performed well at his debut in the European championship and gained a lot of precious experience. From republican tournaments for cups they have 10 first, 10 second and 10 third places. 1. Nikolai Davidkov in men kumite. 2. Bogomil Tiholov in kadets - for him this was the eight Republican title. 3. Georgi Iordanov in kadets kumite. 4. Simona Stoianova in kadets kata. 5. Simona Stoianova in juniors kumite. 6. Mark Chervenkov in children up to 14 years of age kumite. 7. Ivelina Petrova in children up to 14 years of age kumite. 8. Simona Stoianova in children up to 14 years of age kumite. 9. Dzhaner Shukri in children up to 14 years of age kumite. 10. Dian Petkov in children up to 14 years of age kumite. 11. Kaan Shukri in children up to 12 years of age kumite. 12. 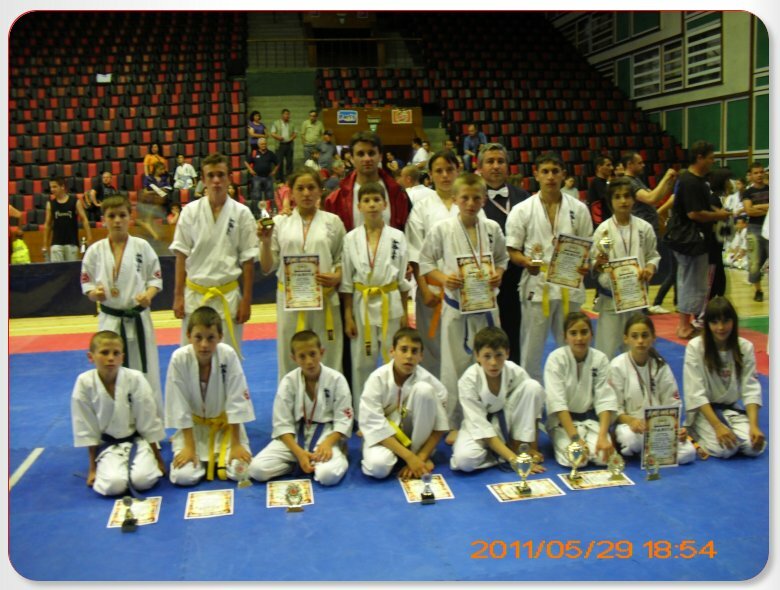 Roberto Vasilev in children up to 12 years of age kumite. 13. Nesrin Nezhdet in children up to 12 years of age kumite. 14. Dian Petkov in children up to 12 years of age kumite. 15. Emil Bachev in children up to 10 years of age kumite. 16. Enis Mustafov in children up to 10 years of age kumite. 17. Engin Mustafa in children up to 10 years of age kumite. 1. Stoian Obretenov in men kata. 2. Osman Osman in juniors. 3. Kaan Shukri in children up to 14 years of age. 4. Roberto Vasilev in children up to 14 years of age. 5. Mario Vladimirov in children up to 14 years of age. 6. Simona Ilieva in children up to 14 years of age. 7. Serpil Galib in children up to 12 years of age. 8. Janeta Ruseva in children up to 12 years of age. 9. Alexander Bachev in children up to 12 years of age. 10. Pervin Useionva in children up to 10 years of age. 11. Ahmet Sabri in children up to 10 years of age. 1. Svetoslav Vasilev in kadets. 2. Osman Osman in kadets. 3. Denis Muzikiarov in kadets. 4. Georgi Iordanov in kadets kata. 5. Ivelina Petrova in juniors. 6. Simona Ilieva in juniors. 7. Serkan Ismailov in children up to 14 years of age. 8. Kaloian Georgiev in children up to 14 years of age. 9. Simeon Grigorov in children up to 12 years of age. 10. Gunai Galibov in children up to 12 years of age. 11. Damna Sezginova in children up to 12 years of age. 12. Radostin Vasilev in children up to 10 years of age. SC "Kyokushin" Shumen has been host to two competitions - the Republican championship for kadets and the International tournament for the "Madarski Konnik" cup for men and women. Municipality of Shumen, Ultima ltd., Antas ltd., Liftkom, Strongstroi ltd., Kodika ltd., 3 S COT, IKON, Siso ltd., Amko-Mebel, PIGMENT design, "Berg - translations"
Shumen's karatekas heartedly thank their friends for without their help the competitors could not have taken part in these strong competitions of the BKKF's sporst calendar. The competitors of SC "Kyokushin" Shumen have an upcoming examination for a higher level of technique /kyu/ and participation in the traditional summer camp with guest instructors sensei Kunihiro Suzuki from Japan and sensei Valeri Dimitrov /nine-time european and two-time world champion/. On 29.05.2011 in the "Vasil Levski" hall in Pazardzik was held the National tournament for the "Pazardzik" cup in Shinkyokushin karate for children up to 12 years of age and juniors. This year the tournament was exceptionally strong and the audience could witness many close matches, in which the young karatekas from clubs of the whole country showed great technical growth, a strong will to win and excellent preparation. Consecutively this year the competitors of SC "Kyokushin" Shumen with chairman senpai Stoian Obretenov - IInd dan made a strong performance, winning 3 gold, 3 silver and 5 bronze medals. 1. Dian Petkov in the boys 12 years of age 33kg category, who was on a higher level than his opponents and took every one of his matches with ipon after strong series of punches in his foes' body and a very well placed chudan mawashi geri. 2. Serpil Galib in the girls 12 years of age 33kg category. 3. Roberto Vasilev in the boys 12 years of age 39kg category. 1. Alexander Bachev in the boys 12 years of age 36kg category, who won his first two matches with avasete ipon and vazaari, after an impecable djodan mawashi geri, took his semifinal by referee's decision and had to fight in his final match with a hurt left leg and maybe this reflected on the outcome of the fight. 2. Simeon Grigorov in boys 12 years of age, who won his quarterfinal and semifinal with vazaari. 3. Ivelina Petrova in the girls juniors 56kg category. 1. Kaan Shukri, who showed great improvement in his game this year and won his quarterfinal and final matches with vazaari after well placed djodan mawashi geri. The competitors of SC "Kyokushin" Shumen were able to take part in the National tournament for the "Pazardzik" cup in Shinkyokushin karate for children up to 12 years of age and juniors thanks to the help of the Municipality of Shumen. Shumen's karatekas continue their training for the upcoming exam for a higher level of technique /kyu/, which will take place in June. 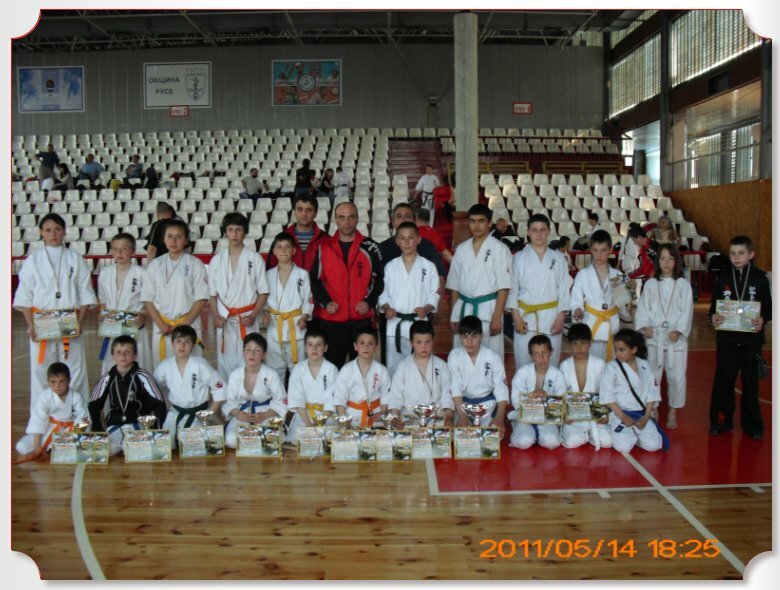 On 14.05.2011 in the "Dunav" hall in Russe was held the National tournament for the "Bulgaria" cup in Shinkyokushin karate for children up to 10 and up to 14 years of age. The competition was very strong and in it took part many of the young talents of the Bulgarian Karate-do Kyokushin Federation from clubs of the whole country. The audience was able to see many close and dynamic matches, in which children fro every club showed great technical growth, excellent preparation and a strong will to win. The competitors of SC "Kyokushin" Shumen with chairman Stoian Obretenov had a very strong presence in the the tournament, winning 7 gold, 6 silver and 4 bronze medals, as well as first place in both team standings for children up to 10 and up to 14 years of age. This solidified Shumen's club as being one of the strongest in these categories. 1. Emil Bachev in the 10 years of age 32kg category, who won his semifinal fight with vazaari after a very well placed djodan mawashi geri. 2. Radostin Vasilev in the 10 years of age 39kg category, who is showing a lot of improvement in his game during this year. 3. Ahmet Sabri in the 10 years of age 30kg category. 4. Djaner Shukri in the 14 years of age 46kg category, who won his final match with vazaari thanks to his strong shita-ski. 5. Dian Petkov in the 14 years of age 33kg category, who won his semifinal with vazaari and in his final knocked his opponent out with chudan mawashi geri. 6. Ivelina Petrova in the 14 years of age 54kg category. 7. Mark Chervenkov in the 14 years of age +57kg category, who was on a higher level than his opponents and convincingly won his semifinal and final matches with ipon. 1. Engin Mustafa in the 10 years of age 32kg category. 2. Lazar Angelov in the 10 years of age 24kg category. 3. Mario Vladimirov in the 14 years of age 36kg category. 4. Simona Ilieva in the 14 years of age +54kg category. 5. Roberto Vasilev in the 14 years of age 39kg category. 6. Gunai Galibov in 14 years of age. 1. Ali Aliev in the 10 years of age +39kg category. 2. Kaan Shukri in 14 years of age. 3. Tsvetomir Genov in the 10 years of age 42kg category. 4. Tatiana Nikolova in the 10 years of age 34kg category. The competitors of SC "Kyokushin" Shumen were able to take part in the National tournament for the "Bulgaria" cup for children up to 10 and 14 years ofa ge thanks to the help of the Municipality of Shumen. Shumen's karatekas continue their training for the National "Tornado" cup tournament in Shinkyokushin karate for children up to 12 years of age and juniors, which will be held on the 28.05.2011 in Pazardzik.